It's been a while since my last post, but I've been quite busy writing my dissertation prospectus (which I will defend on 10/5) and preparing for my first RAW: Natural Born Artist's Showcase. I have a number of pieces planned to make between now and then (and beyond!). So, if you need to update your jewelry wardrobe or are thinking ahead to the winter holiday season, you may want to drop by the RAW Showcase // PROVOCATIONS from7-11pm at Solas in Raleigh on Wednesday, October 3, 2012. The showcase will also feature live music, a fashion show, studio and performance artists, and so much more. So, come join me for an awesome night of local and underground talent! You can support me by purchasing a $10 ticket in my name (see below). Just remember that If you're planning to attend, please buy a $10 ticket by 9/30/12! You can buy a ticket in my name even if you can't attend. And doing so can help another friend get in the show for free. If you do this, let me know, and I'll email you a special thank you code for use at my Etsy shop, Bohemianearth.etsy.com. -There's a parking garage across the street, parking on side streets, and valet. -I'll be accepting cash and all major credit cards. Many thanks in advance for your support! 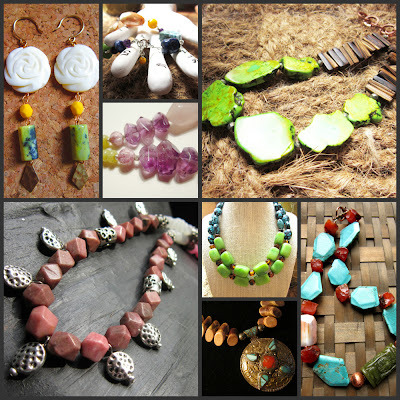 I'll have a lot of new pieces along with my full Bohemian Earth Etsy line.